MarketSaw - 3D Movies, Gaming and Technology: Check Out The New DREDD Photos!! 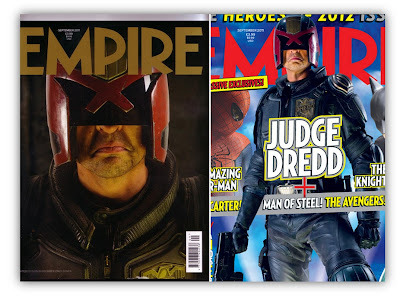 Check Out The New DREDD Photos!! We have more DREDD shots to show you, this time showing off Karl Urban's frown, Olivia Thirlby in action and the suits of the Judges. Is it just me or is that frown on Urban look quite forced? I don't know how I feel about that yet. I have to see his character is action first and Urban is definitely a fine action actor. We all know Dredd frowns a LOT from the comic books, but I have to say at this point I have mixed feelings about how it looks on Urban. It would certainly be intimidating to have a guy walk up to you with the full power of the law to be judge, jury and executioner! Can Urban pull it off? In the end, I think so. The suits look much more utilitarian and realistic than Stallone's over the top plastic looking tinsel. So kudos to Michael O'Connor (THE DUCHESS) who designed these new ones. DREDD sentences us all on September 21, 2012! I really want this thing to work as I really enjoy the character a great deal. I have always been an Urban fan too. I want sequels. I want GOOD sequels.